Sen. Bernie Sanders talks with dairy farmers in East Fairfield. 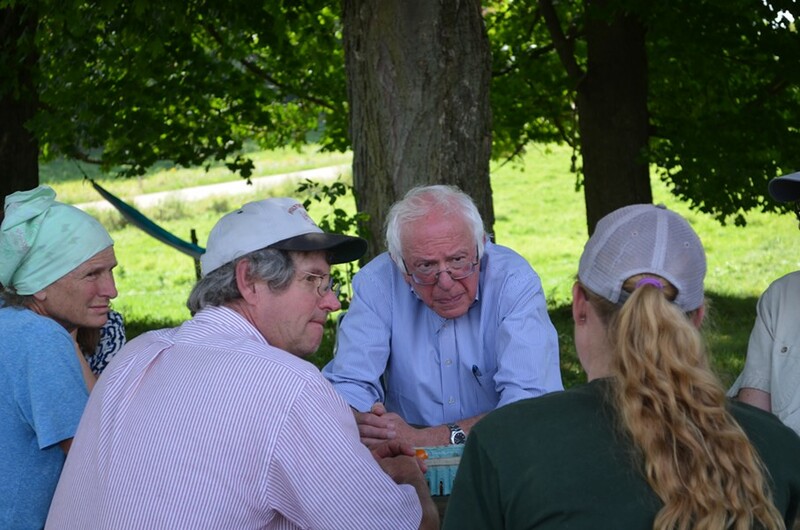 Sen. Bernie Sanders (I-Vt.) seemed comfortable Monday during a swing through Franklin County to meet with core constituents, including health care professionals, senior citizens and dairy farmers. At all three stops, Vermont’s junior senator discussed his “Medicare-for-all” proposal — but he refused to address questions about how hard he’ll push Democrats to back the plan. In the morning, Sanders toured the Northern Tier Center for Health clinic in Richford, where he peppered staff with questions about the opiate epidemic and access to dental care. From there, he traveled to the Franklin County Senior Center in St. Albans and pitched his proposed legislation that would allow anyone to receive Medicare, the federal health insurance program currently available only to people over 65. “We’re taking on the whole world to make this happen,” he told a crowd of more than 50. Residents dined on strawberry shortcake and listened intently as Sanders decried the “outrageous” cost of prescription drugs. He compared the U.S. health care system unfavorably to Canada’s, which provides universal coverage. So when Linda Davignon, of Saint-Georges-de-Clarenceville, Québec, announced her hometown, Sanders asked her how much she pays for a doctor’s visit. “Nothing,” she said as she shaped her fingers into a zero. Sanders answered questions from the audience, including one about how to galvanize the Democratic Party. “I think the Democrats are making some improvements,” Sanders said — before going on to criticize party members for being hesitant to take on powerful interests such as pharmaceutical companies. Outside in the parking lot, Sanders dismissed a reporter’s question about whether he would back primary challengers to Democrats running in 2018 who don’t embrace his health care proposal — a concern among some in the party. “Uh, that’s political gossip which I’m not particularly interested in,” Sanders said, ignoring reporters’ attempts at follow-up questions. He was equally unobliging when a reporter tried to return to the subject later. 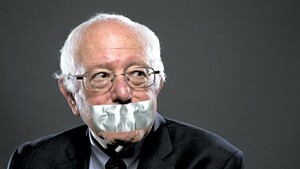 “The Democratic Party … ” the reporter began to ask. 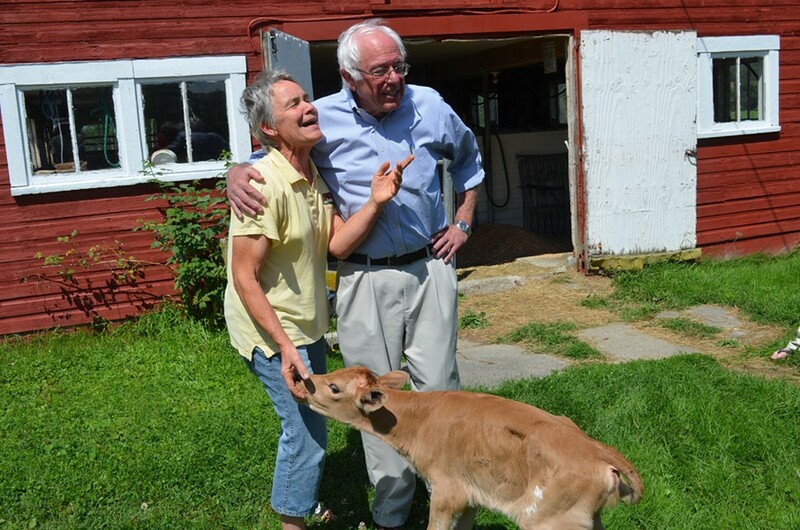 Sanders stands with Linda Stanley and her newborn calf. Sanders also addressed the weekend’s violence in Charlottesville, Va., calling it a “very sad moment in American history.” He went on to blast President Donald Trump for his lackluster response to the white nationalist rally. Sanders’ final stop of the day was to Paul and Linda Stanley’s hillside dairy farm in East Fairfield. A camera crew from Vice News, dressed in black, filmed as Linda introduced Sanders to a day-old calf named Pinky. “Holy moly!” a delighted Sanders exclaimed as it ran wobbly legged by him. After meeting the cow, the senator snacked on fresh cucumbers and cherry tomatoes at a picnic table and discussed the plight of the state’s dairy farms, which are struggling with low milk prices and environmental regulations.